Another outstanding product from Australia's Perth Mint, the 2017 Lunar II Rooster Gold 1 oz coin will be available from 12th September 2016. The 1 oz coin is popular with investors for its purity and unique design and many people purchase these highly marketable bullion coins as part of a pension plan. They are also chosen to mark births - each of the 12 animals in the Chinese Zodiac is said to have a marked influence on those born during their particular year. The 2017 Gold 1 oz Rooster is part of the Lunar II series which was launched in 2008. It features a border of etched lines in a circular pattern surrounding a rooster and several clumps of grass. The design for 2017 was created by Aleysha Howarth and her initials can be found on the coin along with the Pinyin character for 'rooster' and the inscription 'Year of the Rooster'. Like all legal currency in Australia, the coin's obverse shows HM Queen Elizabeth II. 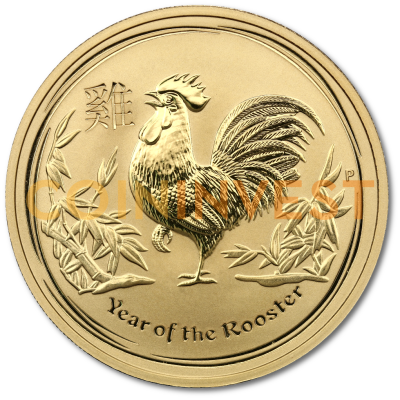 CoinInvest.com is pleased to bring you the 1 oz Lunar II Rooster Gold 2017 bullion coin. Gold is one of the safest options for those wishing to invest excess capital and we offer the 1 oz Rooster Gold 2017 at the most competitive prices. Buy 1 oz Gold Lunar II Year of the Rooster 2017 coins and enjoy an investment that will increase its value over the coming years.